Risnjak has a dominant position at the western end of the region of Gorski kotar, rising from the plateau of Gorski kotar as the final high peak, just before that plateau suddenly starts descending towards the bay of Rijeka in the region of Hrvatsko primorje. The rocky peak area of Risnjak represents a karst phenomenon in itself, and the slopes of that peak area are covered in ancient wide forests, with numerous meadows in the lower sections. 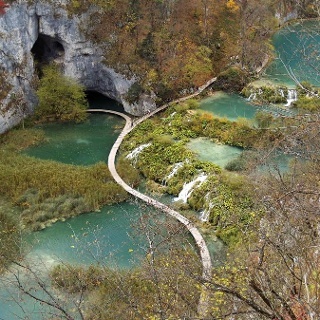 Due to its specific position and exposure to both marine and continental influences, the entire area of Risnjak is marked by rich and diverse flora and interesting animal world. 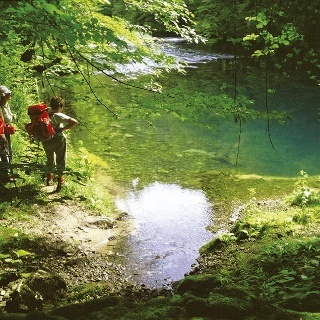 Together with Snježnik on the western side and the source of the Kupa River on the eastern side, Risnjak is protected as a national park. The ridge of Risnjak is spreading in the same direction as the Dinarides. The peak area is recognizable from far away, due to the rocky peaks of Veliki Risnjak and Mali Risnjak, separated by a mountain pass with a mountain hut. On the western side, the ridge of Risnjak is separated from Snježnik by a valley deeply cut into the terrain, with a forest road that leads from Gornje Jelenje towards Gerovo, passing through it. This road is quite useful to hikers, as it provides the shortest access to the peak area of Risnjak. On the eastern side, the slopes of Risnjak descend rather more mildly to Crni Lug. 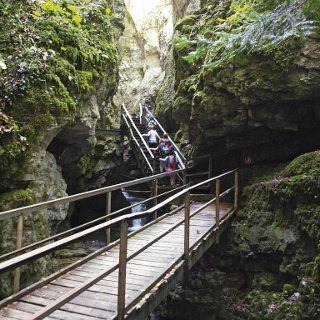 There are several well maintained hiking trails that lead from Crni Lug to the peak area of Risnjak. All these trails take hikers through forests and cover a substantial elevation difference; however, orientation along these trails is not difficult. The most frequently used trail is the so-called Horvat Trail (Horvatova staza) – named after a mountaineer, botanist and researcher Ivo Horvat. 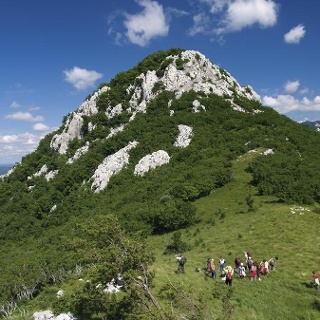 Some 3 to 4 hours of hiking are needed to climb from Crni Lug to Risnjak in summer conditions.